For better and for worse, DC is fully committed to the reboot/retcon of the Main Man. They may have fragged up the classic character but good. It's a common adage that you don't really appreciate something until it's gone. That neatly sums up how I feel about Lobo. When first introduced to the character in a Superman crossover nearly twenty years ago, I thought he was amazing. He was crass. Violent. As powerful as Superman on a bright, sunny day. And most importantly, he was having fun. My appreciation grew when Lobo appeared on Superman: The Animated Series and Justice League. Simply put, Lobo was fraggin' awesome. And all was well. As I got older, I came to understand more of Lobo's history. Originally intended as a parody of ultra-violent comics of the 80s and 90s, that he became a mega-hit by himself surprised even his creators. But, because the character was so exaggerated, he became something uniquely original. Lobo was basically a cartoon character in the DC Universe, mocking comic book violence by exaggerating it to the point of silliness. Lobo's appeal, ultimately, is that you're never supposed to take him completely seriously. 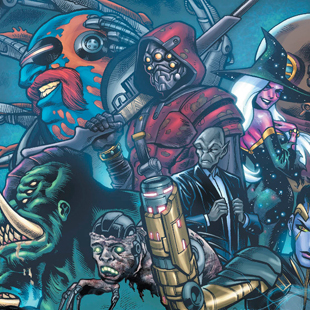 So how, exactly, did the New 52 miss the point so completely? According to the New 52, the Lobo we're familiar with isn't the true Lobo at all. He's an impostor who stole Lobo's name and legendary reputation as the murderer of an entire race. The true Lobo is actually a thin, cultured, and ruthless mercenary. While just as capable of dishing out violence as his pretender, the "real" Lobo is a far more serious and educated type than a raging force of nature. Lobo also follows a strict warrior code, and he's the best at what he does. (A claim to which I'm sure Deathstroke and Wolverine wouldn't object.) It's this Lobo that has his own ongoing comic series. As the first issue begins, Lobo is recovering after having brutally killed the "fake" Lobo. Unfortunately, the collateral damage from that brawl means he must take a job he'd rather have avoided: Return to Earth, and prevent eight deadly bounty hunters from killing their target. Lobo confronts the first bounty hunter in this chapter, but one big question remains: Why wouldn't the individual who hired these bounty hunters have turned to Lobo in the first place? To its credit, that's actually a decent premise. 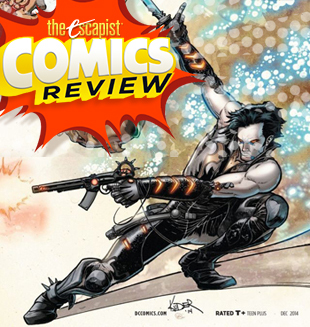 Lobo's past visits have left him with a disdain for Earth, so being forced to return for what amounts to a violent rescue mission has a great deal of story potential. It allows for several battlegrounds located across various nations. It implies that the final enemy has some connection to Lobo's past. And on top of that, it leaves lots of room for superhero crossovers as the storyline progresses.